A vast, splendid and wildlife dotted landscape is Tanzania, the largest country in East Africa-945,087 km² with the extensive safari parks in the region. Walking isn’t the first mode of carrying out a safari that could come into one’s mind, Tanzania wildlife safaris are popularly carried out on 4×4 WD safari vehicles with pop up roofs for up close viewing of wild animals. What about undertaking a walking safari in Tanzania, it’s a more sensory way of reassuring the aliveness of the African bush, here are the top walking Tanzania safari destinations . Ruaha National Park is Tanzania’s largest park covering 20,226 square kilometers (7,809 sq. mi). 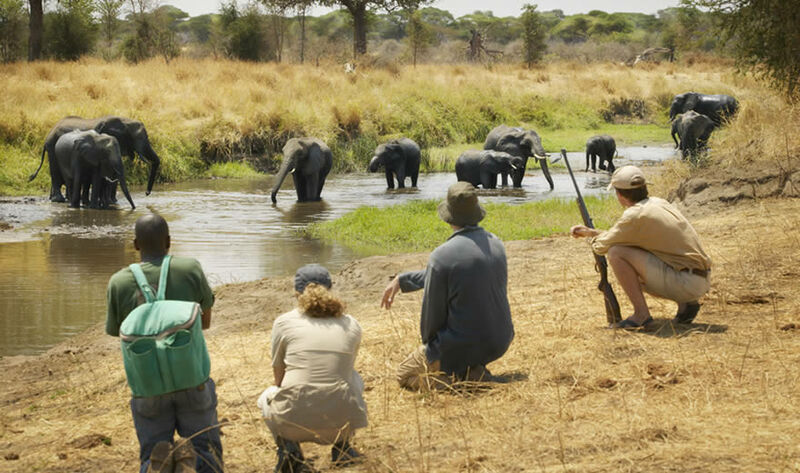 Walking Safaris in Ruaha are conducted by Kichaka expeditions operating in the quiet eastern end of the park with the base camp located in a glade on the banks of the Ruaha River. On the walk, you leave from your luxury camp and head towards the Ruaha River where you sight Elephants feed along the river banks in search of fruits from the large shady acacia trees. Sable, greater and lesser kudu, roan, waterbuck, Impala antelopes among others are common sights. Lion and leopard frequent the river banks and flood plains. Walks are guided by experts in the walking safaris as you explore as much wildlife as your eyes can let you, its an experience like no other. With one of the worlds’ seven wonders-wildebeest migration, everyone knows the Serengeti National Park is famous for the game drives in search of wildlife in the park and many haven’t ever known of the possibility of doing a walking safari in the park. Only a handful of companies are allowed to walk in the Serengeti, but there are extensive wilderness zones where game driving vehicles aren’t allowed to visit. On a walking safari here, the pace is gentle and the terrain varied. The scattered rocky kopjes make wonderful lookouts or camp sites for the animals. On the walk, you can sit under the big fig trees with great views and relax at your tent in the evening. The massive Selous Game Reserve is home to Massive rivers, tributaries, lakes and woodland with a wild environment hosting mega fauna. Walking safaris in Selous have been made easy by the paths created by the elephants and hippos, the extensive path I the soft sandy soil makes it convenient to connect from the river to the all of the lakes. Along these paths go other wild animals. 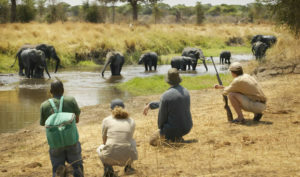 The walking safaris can be of two options within the water ways. You can walk quietly up to a lake shore, sit in the shade with a drink and a bite of lunch as wildlife comes and goes throughout the day. Or else, meet a boat and drift silently downstream to a fly camp on an island in mid-stream. Katavi is an amazing wild place to go for a walk. The wildlife in the park collects within the seasonal rivers at the center of Katavi’s flood plains especially during the dry month. A walk here exposes you to a number of hippos, crocodiles in the pools and much more. Walking here is usually for a night or two as part of a stay at Chada Camp, although longer walks of several days can be arranged. Every time of the year can be best safari time for a specific area or activity. A walking safari in Tanzania is best during the dry season. For Tarangire National Park the dry season of between late July to late October is the best. For a Tanzania birding safari tourist undertaking a walking safari in the park, the season from December to May, is the best as Tarangire’s birdlife comes alive in all its plumage. For Ruaha National Park, the best time for Tanzania safaris tours on foot is during the dry months of June – October. The same time is applicable for Serengeti National Park and Selous Game Reserve. Katavi walking safaris are best done during the dry season July to September. Why not uncover Tanzania in a different way, take a walk in the wild and experience the liveness of Africa’s wild with all of your senses active.